Patreon Supporters get to read all articles two weeks before they go public, have access to an extensive testing video library, a specifically competitive podcast featuring the best of the best players from around the world, special gifts, limited access tournaments, and more. If this sounds appealing, check us out at Patreon.com/TheArtificeryCrew, and a huge thank you to all our supporters who help make this possible. *Since I had already won Las Vegas and am not going to take away someone’s Worlds Seat or Nationals Bye, I conceded in the final round. Jefferson and I shook hands, then since we just so happened to be in the same place at the same time he offered to play a match on stream with me with nothing on the line but a trophy, which I went home with. The deck selection process for this was actually pretty straightforward as compared to previous tournaments. I very specifically did not want to try and figure out what the best deck is. I didn’t have an answer to that then, I don’t have an answer to that now. I knew I was going to use my bye because it was my home regional, so the big question is Vader. But as I’ve said before, there isn’t enough room to maneuver in any iteration of Vader that I have built or seen someone else build. The Terror To Behold is certainly effective, and he is certainly capable of winning any game if things go his way but he is very rarely doing anything unexpected. And yet… I did briefly consider playing Vader, and even had Pearl Yeti bring me a deck all the way from Portland just in case I audibled over to him (my wonderful wife LadyVader has first last and permanent claim over any Vader related cards in our house). But I stuck to my guns and picked from a very short list of decks that met some very specific criteria I had laid out beforehand. A.) Be able to defeat Vader convincingly, the majority of the time, on either player’s BF. B.) Be something people aren’t very well practiced against in a general sense, or be able to change the specific contents of the deck enough to introduce surprise plays. C.) Have a viable game plan against Firespray and Shadowcaster aside from Disable. About a week out, I had it narrowed down to three decks. Yoda/Leia Mill, Han/Qira, and Hero Vehicles. 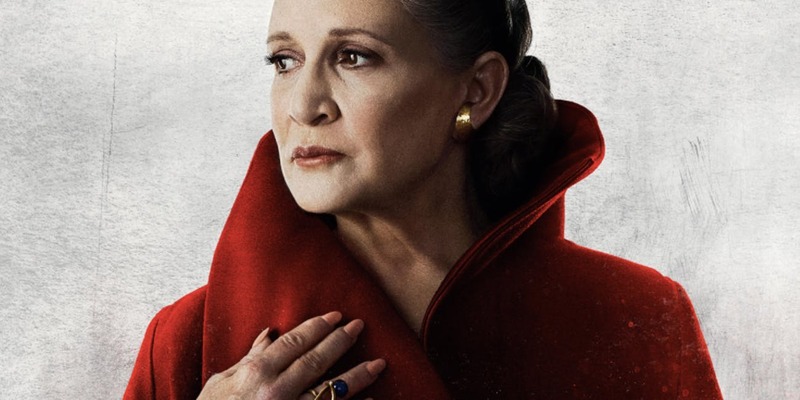 Han/Qira left consideration pretty swiftly, because I am a coward. 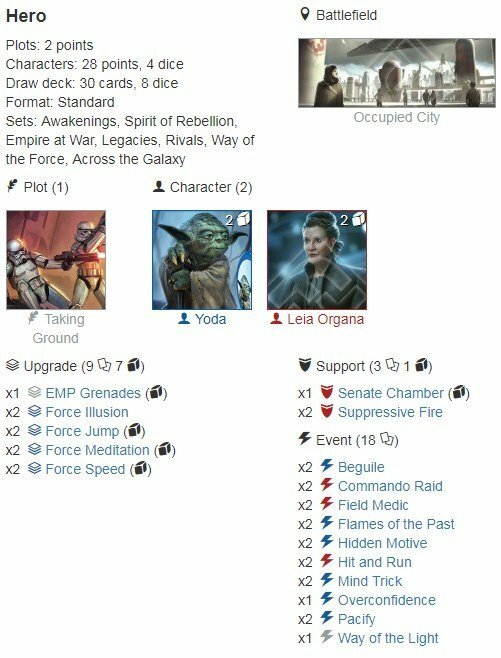 Han/Qira has zero auto-loss matchups that I have seen in this meta, not even against Kylo. The problem I had was that it had zero auto-win matchups either. The level of play and decision making necessary to go six BO1 and three BO3 matches was beyond what I was willing to put myself through. I’ve never really played mill at a high level so I reached out four days prior to the best mill player I know, Reflex of The Hyperloops, for some deck advice. He gave me a grip of new cards to consider, prodded my way of thinking to reach a conclusion I am sure he had figured out months ago, and patted me on the head. I sure did feel smart! After trying things out for a couple of days, I ended up totally disregarding the majority of the advice I was given because I was not going to be able to adjust my playstyle and shore up my own weaknesses as a player enough to make it work. I kept a few suggestions though and ran with them, ending up at the final list below. I know I am being vague about the details but I was asked to keep his specific tricks under wraps until his regional. Note: Reflex ended up running three-wide, but his version was very focused on maintaining speed and BF control, with Snuff Out and Command Center as two major inclusions. In the back of my mind though, was Hero Vehicles in two forms, eYoda/eL3/Gungan, and Wedge/eRose/HG. Both were very comfortable to me, and definitely felt good against Vader, but the decision to go Vehicles at GenCon was still haunting me. So coming all the way up to three minutes prior to the deck registration I was torn. The final deciding factor was both Yeti and LadyVader herself telling me to shut up and play mill. As always, human memory is imperfect and any incorrect retelling of events in the recall of these rounds were inserted by me wholesale. If I get names mixed up or a sequence of events out of order please contact me and I will correct them ASAP. Used the bye. Just as good this year as it was last year. Gave me time to listen to music, get some caffeine, and chat with some people I haven’t seen in a while. All of my testing had indicated to me that some very bad things would have to occur to lose to a Vader deck. Welp. Bad things happened here, and I don’t think any deck I could possibly have played would have gotten the job done. Randy pushed me to a loss so fast and so unerringly that I was thinking about taking my Artificery shirt off and trying to go unnoticed for the rest of the day. Leia was dead by the end of Round 2 against a Round 1 Vader’s Saber gotten off the back of Theed, bolstered by a card I had not considered in the slightest. Legacies. This card is awesome for Vader, and Randy definately knew where his priorities lay. He made a beeline for Leia’s head and didn’t let off the gas until he got it. I was able to wipe his whole hand in Round 1 and 2, but it didn’t matter because I never even considered the possibility of a “stranded” saber die getting resolved. I did take him to the very bitter end though, the last sequence of the game was Yoda sitting on 1 HP left, nothing of note rolled out across his dice or the Force Jump and Force Speed. I had plenty of mitigation in hand, and he rolled out base melee on both Vader dice, and a resource on both a Darksaber and Ancient. I knew he had B&S in hand, and Beguile can only touch three dice. I kept my jersey on, checked the pairings, and despaired. Revan is one of our top local players, and the number of times we have had what anyone could consider to be a “good game” in a Store Championship or higher event is zero, we just alternate merciless beatdowns. We both very diligently track who won the last showdown in a “Ha Ha only serious” sort of way. I was due a win this time, and I got it. I received a near-perfect draw with both Force Jumps, I won the BF roll (but missed one of my own triggers like a dummy), I had adequate backup mitigation, and timely Commando Raids with focus to spare at the end for Leia’s power action. My deck ran itself this round, I just happened to be in the chair. Justin hails from the Los Angeles area, we only see each-other when making the Store Championship rounds. Being able to spend time with the players from other areas is one of the reasons Store Championship season is my favorite time of the Destiny year, and people like Justin are why. Ritual exchanging of pleasantries occurred, and we were underway. His deck was pretty similar to one of my shortlisted candidates, in my opinion with some better and some worse card choices. I was taken by surprise when he took control of Landing Dock with his last card in hand after I claimed Round 1, then surprised again when I was reminded the hard way that the PA on that battlefield can hit any die on the field. Since his first vehicle played was an X-Wing I immediately shifted everything I had to prioritize burning his deck rather than his hand, with the reasoning being that if he had any X-Wings at the start of a round he would play them immediately, and that the Hailfires he was sure to have brought would be less effective with less vehicles to draw into, and that I could do a hail-mary discard at his hand if necessary if I ever saw a resource stockpile. I managed to get one other X-Wing into the discard, but more importantly took both of the Hailfires out of the deck in the process. He was able to get the last two X-Wings down and bolster them with an N-1, but with no actual direct damage dealt for the entire game I was able to finish off his last remaining cards and play a Mind Trick on all dice in the pool to keep both characters alive. Man this was tough game. Of all the Vader pairings to play mill into, Vader/Red is the hardest. Of all of those, the one that gives Vader free damage even when his char dice are removed is the worst by far (though Nute is irritating). Combine that with someone who both clearly tested against mill and put thought into the matchup from both points of view, and it took everything I had to hold on. I can’t remember very many details from the match, except that I won the rolloff and he immediately put shields on his droid, telling me he either has two copies of The Best Defense or that he had one in his hand. I was able to get a Force Jump out early and focus on removing his Saber while just keeping the char dice unresolvable, but it was slow going through the actual cards. The weird thing about mill is how close or far away from winning you feel at any given time. I usually ask for a deck count at the start of round 3 or 4, and no matter what I’m blown away by the number. 4? How did I get that deep? This match was at the other end of the spectrum. Seven left in deck and five in hand at the end of round 4. How can I be so far behind? Two At-Odds, and Vader’s Meditation Chamber. That’s how. I managed to mill a copy of Vader’s Fist earlier, which he ended up putting on the bottom of the deck and he had the Saber in play, so I needed to keep my Flames in hand all the way from Round 1 and only have Pacify and Overconfidence as mitigation in hand. I rolled out Yoda to an extremely good roll except for the Force Jump but with only 4HP remaining. He rolled out Vader to nothing of note except his own Force Speed. 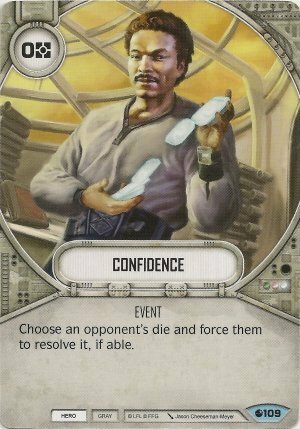 I can’t play Pacify because Yoda takes 1 from Retribution, then has a 33% of dying on a Force Speeded power action roll. I go in the tank a bit and come up with a high-risk high-reward play that ended up paying off. I play overconfidence on my Force Jump and his Force Speed, and came out on top. Strict rationing of my Yoda specials and use of Pacify for the rest of the round kept Yoda alive and burned both At-Odds and the Fist buried earlier in one go. This ended up letting me Commando Raid his hand the next round and have an auto-win on board the next round. But since he had ended round 5 with more than 5 resources, that’s when I realized the mad genius of Kevin. He only put one copy of Fist in the deck, and held his second saber the whole game! It very nearly won him the match by clogging my hand up the whole game, which was far more impactful than him holding on to one card would ever be. Notably (unless my memory of the top cut is wrong), Kevin is the only person I played against who never missed an Occupied City trigger while they had control of it. Hats off to Kevin, Corwin, and their Dad for their performance this weekend, you can check out their take on the regional here. Another Vader round, this time with his Jawa friend. Jawa I don’t mind so much but the Retribution plot reared its head again. I can remember very little from this round, my apologies to Ken. I know it didn’t go very well for him from the start since I was able to set up Commando Raid hand-wipes relatively early and stockpile a slush fund for a rainy day. The end of the game was him playing Vader’s Fist, then needing to reroll the die into my held Flames of the Past. With either one or two cards left total and both of my chars still alive I closed it out. Oh boy. I had heard there was a Planned Explosion deck running rampant on people. Was hoping to dodge it, but it was my fate. I won this round through luck. Pure and simple. I keep EMP grenades in my opener, windmill slam it on Yoda thinking I’m king of the world, roll Yoda out to double discard sides for the green man and a natural special on EMP Grenades. I couldn’t help but just laugh. I’m thinking there is no way I am coming back from getting double-disrupted out of my one answer to the one vehicle I am all but powerless to effect otherwise. I saw the Shadowcaster, he knows I saw the Shadowcaster, I have to resolve double discard from Yoda and take my 50/50 shot at clawing back. Not only did I get the Shadowcaster, I get a Planned Explosion. At the end of the round he had claimed early and left a couple dice hanging out which I thought was odd. With only one card left in his hand and a Leia 2-Discard side on my side of the board I went with my gut to take the card from hand rather than two off the deck and got the other Planned Explosion. Subsequent to that, across a total of two Partnerships and one Attack Run with the Legacies Falcon chosen twice, and his other Shadowcaster chosen once, he only found four damage he could resolve ahead of my mitigation. Like I said. Pure luck. And not to retread old ground, Jerry ended up in 9th place overall when by all rights he should most likely have been in the top 8 but for some other unpleasantness. He had nothing but the most upbeat attitude throughout the entire round and every time I saw him thereafter, so it just goes to prove once again that Destiny really does have the best community of any game right now. I wish that he had gotten able to take his shot at the trophy inside the top 8. I actually have stream coverage of my run in all three rounds of the top cut! In the process of commentating over it I started to feel drained, almost just as drained as playing through the top cut in the first place, which really shows why mill isn’t very popular to play or play against I think. It was hard all day, against some very tough opponents, and even then I required a certain amount of luck to get through it all. I hope you enjoy the matches and find some value in the commentary, if not and you would prefer to just watch with table audio the VODs are available for the entire tournament over on Twitch.tv/Artificery for all the Table 1 matches, and all of the Table 2 matches over at Monks Gaming Battlefield. The deck treated me very well, and I would play it again for sure. It has the capability to win against the most popular decks you are nearly guaranteed to see in every tournament. Solid all the way through. A.) Tournament was capped to 60 players to give priority to an MTG event. Store did not provide adequate notice that the tournament was capped, resulting in 20 people driving hours out of their way to be turned back. B.) Store did not provide any employee staffing or support to organize, run, or judge the tournament. This resulted in the TO responsibilities being shouldered by one of our local mainstay and competitive players, who would have preferred to play, and did not anticipate any of the issues which arose and made the best of a bad situation. C.) Store did not initially provide printing supplies for pairings and match slips, resulting in a 50 minute delay in tournament start time. D.) Store did not provide adequate toilet facilities, one single-stall restroom was shared between over 100 people for a large portion of the day. E.) Store charged $20 entry and gave zero prize support aside from the tournament kit. This is a contentious point to make. The kit costs around $200, and stores aren’t charity. I get it. I’m a capitalist. If a store doesn’t expect or can’t hold more than 32 or so people, I don’t expect much if anything at all in addition to the kit. The first ten people buy the kit, the next ten pay for store labor costs, and then the store gets to keep the lights on and make profit from the rest of the players plus snacks/drinks purchases. Perfectly fair. What I don’t expect is absolutely nothing from a store that sells out all 60 spots at $20 a head, and provides nothing in the way of support aside from the roof over the tables. This meant that 60 people came together to rent a room for $1000. If we had just done that, we would have exclusive use of the space and wouldn’t have needed to cap attendance. Not to mention, event venues usually have adequate restroom facilities. Right off the top of my head, the store could have offered $300 in store credit to the top cut or as an attendance raffle, and thrown in a couple of boxes. The boxes cost the store about $55 each wholesale, and anyone from out of town would spend the store credit immediately, which when you include the expected (and necessary) markup a brick and mortar location has, means the store gets a fair amount back right off the rip depending on what was bought. Call the outlay $250 as a good will offering, taking some sting off of the rest of the venue issues which plagued us. By itself, this is irritating. Combined with all of the other stuff above? I’m never walking back in there, and that store was the most convenient for me to go to by a wide margin. Previous post: Addressing the Cheating Allegations at the SD Regional.